Wondering what to do with a bowl full of summer peaches? While we always enjoy eating the fuzzy gems whole, throwing them into a salad with mozzarella and balsamic, or baking them with blackberries and a buttery crumbly topping, we decide to incorporate them into a cocktail. 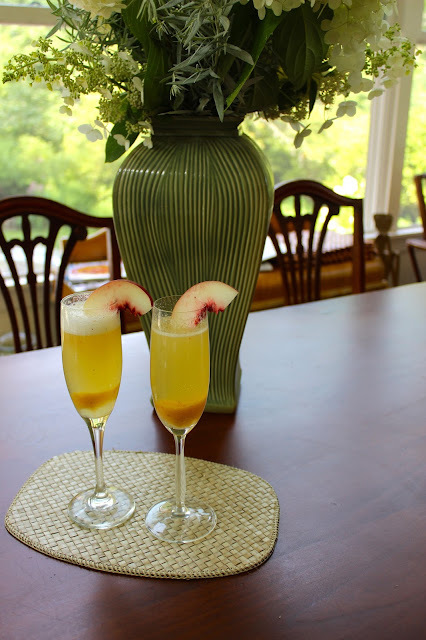 Instead of a Mimosa for a weekend brunch, we prefer adding peach puree to Prosecco. We first tried this sophisticated sparkler in Venice after a morning winding through the canal-adorned streets. We learned from our charming server that the beverage was coined Bellini back in the mid-1900s due to its unique rosy hue found in a painting by the famed fifteenth century Venetian artist, Giovanni Bellini. Linking art to food, we instantly added this bubbly cocktail to our entertaining repertoire. We use white peaches in our version which may be a bit difficult to find, but as a garnish, the white interior and blush exterior makes quite the difference in presentation. Place the 2 peaches, sugar and lemon juice in a food processor or blender and blend until smooth. Press the mixture through a sieve. Place 2 tablespoons of the strained peach puree into a Champagne flute and fill with the Prosecco. Float a white peach garnish and continue with the remaining glasses. Serves 6. This drink is also super quick to make...just a few minutes and you’re floating on a Venetian gondola!